The recent publication by MSC of drawings of its two 4,140-berth “Seaside” class ships, to be built by Fincantieri, illustrate some interesting changes in cruise ship design. In this case, it is the relocation of the ship’s engine and funnel to the traditional midships position once more. With the use of pods instead of propellers, and electric power, the absence of long propeller shafts has negated the need to have a ship’s engines aft, a trend that could be said to have been started by P&O’s Canberra in 1961, a move that was reinforced by the construction of the first modern cruise ships in the late 1960s and early 1970s. 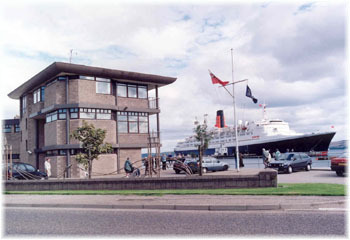 The sole exceptions to this engines-aft trend were Queen Elizabeth 2 of 1969, although her funnel was located somewhat aft of amidships, and Vistafjord of 1973, both of which are today being converted into floating hotels. The first important modern ship to show this new funnel amidships arrangement was the 2,620-berth Queen Mary 2 a decade ago, although like Queen Elizabeth 2 her funnel is also slightly aft of amidships. Nevertheless, Queen Mary 2 was the first major ocean liner, as opposed to cruise ship, to use the pods that eliminated the need for a propeller shaft, and it was this that allowed her to become the first passenger ship in three decades to be built with funnel almost amidships again. As to the layout of the ships themselves, slowly over the years passenger cabins have migrated from within the hull of the ship, with lounges on top, up into the superstructure, where they can easily be equipped with balconies. 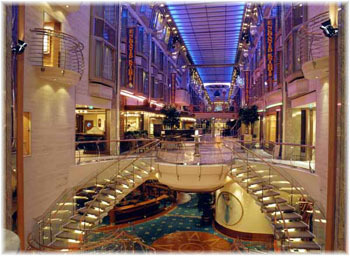 Public areas and the promenade deck have in turn migrated from the top of the ship to a location closer to the sea, while the open air and pool areas are installed atop the ship. 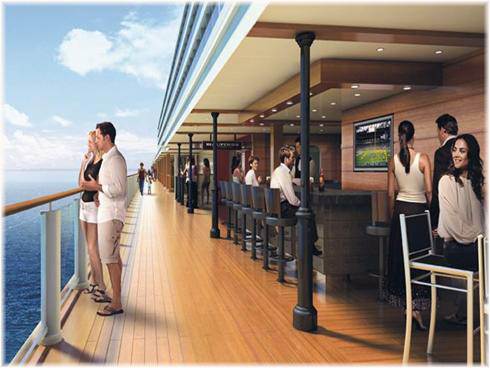 Another trend, now being picked up by MSC in its new 4,500-berth orders from STX, is the internal promenade. As ships have got wider, it has made sense to locate more public areas, bars and restaurants internally, thus leaving outside spaces for passenger accommodation. Royal Caribbean International has been a big believer in this concept, which it adapted from the Silja Line night ferries running between Helsinki and Stockholm. To a lesser extent, first Star Cruises and then Norwegian Cruise Line, whose ships, like Royal Caribbean’s, also feature inward-facing “outside” cabins, adopted the idea. MSC’s new “Seaside” class however, point the way to narrower superstructures and more outside deck areas, including a cantilevered promenade deck with substantially more outside space, below which hang the lifeboats. Instead of having to go inside to move from one part of the ship to another, it will be possible on these new MSC ships to do so on the outside. Providing that it can be sheltered from the elements, and the new “Seaside” ships will conform this, it would seem to be a far more attractive arrangement of public spaces, with the ship’s passengers being able to enjoy the sea. The Pioneer in this regard is Norwegian Cruise Line, whose Waterfront design on its new “Breakaway” class ships, a quarter-mile-long ocean-facing boardwalk, preceded MSC’s “Seasides.” The difference appears to be that in addition to the Waterfront’s bars and restaurants, the “Seaside” class ships will have shops facing onto the sea. It is likely that the “Seasides” will see more service in warm weather areas, while ships equipped with internal promenades prove more useful in northern areas like New York in the winter and the Mediterranean year-round. Effectively, MSC seem to have ordered two summer ships from Fincantieri and two winter ships from STX, with options for more. Given the right weather, these new outward-facing promenades will surely prove to be a great advance since the days of the original 100,000-tonner, the 2,642-berth Carnival Destiny of 1996, where all public areas faced inwards onto the ship’s atrium. That ship has now been rebuilt as the 3,006-berth Carnival Sunshine but even Carnival has “seen the light” of the outdoors, installing wrap-around promenade decks onto its latest cruise ships, 3,646-berth Carnival Dream and Carnival Magic. These vessels feature wide outdoor promenade decks that include an outdoor cafe and whirlpool Jacuzzi in four places along the outside deck. One other trend in recent years is the reversion to two funnels again, something not seen since Queen Elizabeth, Mauretania and France, which became Norway in 1980. The new trend started with the 1,750-berth Disney Magic and Disney Wonder in 1998-99, which adopted twin funnels purely for reasons of nostalgia, as the ships were meant to evoke the old ocean liners of yore. Holland America Line followed in the 2000s with six “Vista” types (the 1,848-berth Zuiderdam through 2,106-berth Nieuw Amsterdam) and will soon add two 2,660-berth “Pinnacle” class ships, while Celebrity Cruises has produced its five 2,852-berth Celebrity Solstice class ships, the last of which was delivered in 2012. With the addition of the 2,500-berth Disney Dream and Disney Fantasy, cruise ships have now entered a size bracket where two funnels have become relatively common again. Indeed, after P&O’s new 3,600-berth Britannia and the new “Pinnacle” class ships are delivered, there will be eighteen ships carrying two funnels in the fore-and-aft mode. It has to be added, however, that with the exception of the Disney ships, the other fourteen ships all carry their twin funnels aft and only Disney effectively reproduces the old look.